Kano (Nigeria) (AFP) - Young boys scramble up the remains of a crumbling section of the ancient city wall in the Kofar Na'isa area of Kano, in northern Nigeria. "This wall may not survive the rainy season," warned Falalu Musa, a local resident. "It will soon join the others," he added, pointing to mounds of red earth lying nearby. Houses and commercial buildings have sprung up on other demolished sections or been turned into dumping grounds for rubbish, litter and sewage from the ever more crowded city. Elsewhere, excavators dig into the fortifications for the red iron- and aluminium-rich rock laterite, which is loaded onto donkeys and taken away for use in construction and renovation. What remains of the weakened walls that once stretched 14 kilometres (nine miles) around the city is then prone to crumble at the foundations and collapse when the rains come. The historic walls are under threat as never before from a combination of an exploding population that has put pressure on land and housing, as well as local politics. 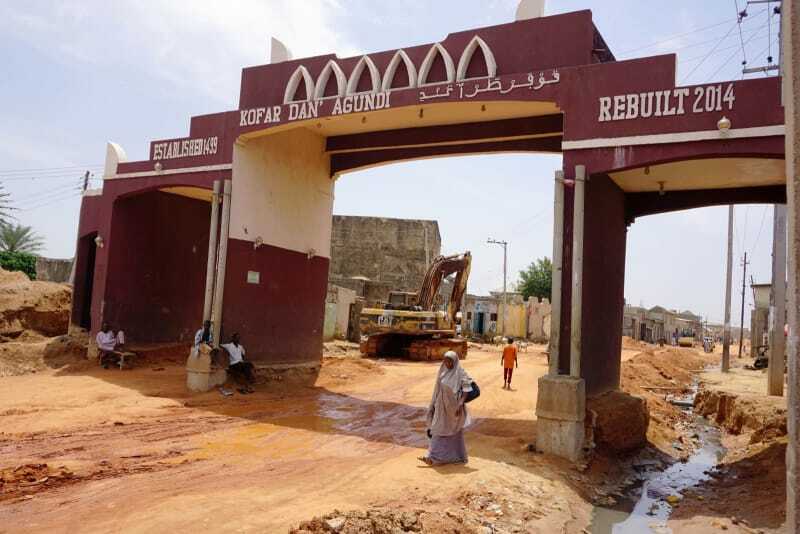 "If you look at the city wall generally, almost 80 percent of it has been destroyed," the curator of the Gidan Makama Museum in Kano, Mustapha Bachaka, told AFP. The walls no longer mark the city limits. "There is a lot of encroachment," he added. Now, those wanting to protect the city's unique heritage are appealing for fresh funding to shore up the ancient defences before it is too late. The mud walls date back to the 11th century and have come to define Kano as an ancient city state, attracting archaeologists' attention and tourists from across the world. Local archives record that in their original state the walls were 15 metres (50 feet) high and 12 metres thick at the base, with a broad rampart walk. Surrounding the wall were added trenches several metres deep to further deter would-be invaders, while access was controlled by 13 large entrance gates. Two more have since been added. "It was a magnificent work of military engineering, which captivated the British when they conquered Kano in 1903," said Aliyu Abdu, from the National Commission for Museums and Monuments. Despite their shared culture, language and tradition, rivalry, warfare and conquest were the norm in pre-colonial Hausa states that now make up most of northern Nigeria. But the city, now home to most of the estimated 13 million people living in Kano state, survived and developed into an important centre for Islamic scholarship, industry and a trading hub for the wider region. "Wars were everywhere in Hausaland, just for territorial expansion. The city wall provided protection against invasion," Bachaka said. "Without these walls there would have been no Kano by now." Abdu blamed the Kano state government as "the main culprit" for the degradation of the city walls. "The government is giving out land around the city wall to political supporters to compensate them for their support," he said. That has robbed them of the moral authority to punish anyone who encroaches themselves. No one from the government responded to requests for comment. But the situation demonstrates the difficulties in protecting sites of historic and national interest. The National Commission for Museums and Monuments took over protection of the walls from the Emir of Kano, the spiritual leader who is revered across the Muslim-majority north. In 2007, the commission submitted a bid to have the walls, the emir's palace and other places of interest declared a UNESCO World Heritage site. But little or no progress has been made in the last 10 years. Experts fear that securing global protection status is unlikely if they are unable to save the walls from further damage. "It is an irony that while we are making efforts to put Kano walls on the World Heritage map, people have turned them into pit latrines," Bachaka said. Those keen to preserve the walls for generations to come say the widespread damage can be salvaged if money is found to fund the work. The only work carried out in recent years was thanks to a 58,000 euro ($68,000) grant from the German government. In the meantime, the Kano museum has set up a monitoring team to patrol the remaining walls to stop encroachment. "This is all we can do in the interim," said the commission's Abdu. "Despite the challenges, it will not be a lost battle."